The Something Savoury challenge is to get people who do not ordinarily cook into the kitchen to try their hand at something. I use the challenge to cook something out of my ‘must try this’ file. The challenge for this week is make something savoury using cabbage. There is no end date to the challenge as this is about challenging yourself. Cindy’s fine pair are the most beautiful red pears, which she submitted for the regional and seasonal challenge. For the same challenge Sue has come up with a Stilton, broccoli and pear quiche – flavours that really get me intrigued. Mandy has made some lovely pinotage pears that are worth trying. Le Creuset sponsored this challenge and the first entry was from The Gorgeous Gourmet and she baked a black forest cake. Cindy was next to enter, and she has come up with mini fig tarts. The third entry is from Mandy and she has turned a cinnamon cake into cupcakes. Sue has entered gingerbread cupcakes with French buttercream frosting. Baglady has made a bread and butter pudding for her entry. The Gorgeous Gourmet send in extra entries – one for Two Tone Heart Biscuits and the other for Profiteroles filled with Maple Mousse. Emily has shared a beautiful photograph of her cinnabons – and I am looking forward to her blog. Add to Taste has baked an orange yoghurt cake with a twist. Durbaness made chocolate chip cookies for the first time. Lara baked an apple crumble – this is her second attempt ever at baking! The next entry I received was from Colleen and she made my favourite crème brûlée for the first time. NaNuZa has submitted her entry of coffee cake. The last entry came from PinkPolkaDot and she has baked a green fig and cheddar cheese roll! I wrote down a list of the dishes prepared and gave them to Dave to choose a winner – I did not want to be left with this hard decision as each and every recipe is fantastic in my opinion. Dave did not know who submitted which recipe, and so his choice was not based on the blogger, but on the dish itself. He also has not seen the blog posts. Dave ended up with 3 on his short list – and he has placed them. Sadly, only the winner gets the prize but I thought I would share with you his choices. His third place choice which he said was very interesting was Cindy with her mini fig tarts. In second place was the black forest cake and the winner *drum roll* is Candice with her profiteroles filled with maple mouse – well done! Sigh. 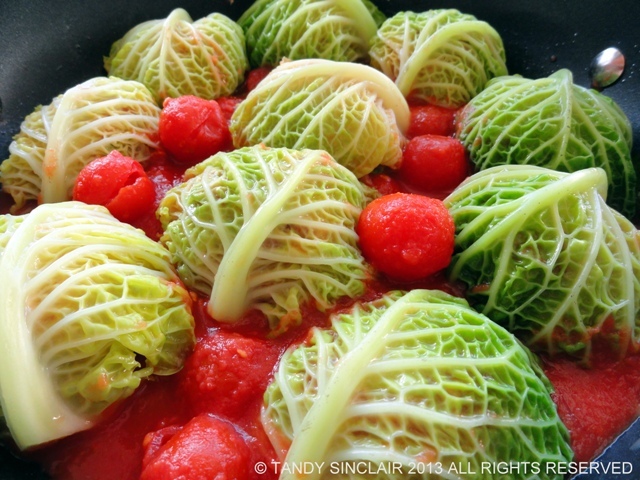 I have tried to cabbage dishes this week and have not been happy enough with either of them to post them on the blog! The first was my attempt at cabbage rolls stuffed with brown rice, mushrooms, spring onion and peppadews, with a maple glaze. The second was a cabbage gratin, slow cooked with butter, stock, and dolloped with cream cheese at the end. Sigh. I think cabbage and I will just never be friends. I have my fingers crossed! I’m glad you at least have a recipe that works! Congratulations again to Candice and thanks for the mentions and link backs. Thanks for the mentions and links, gosh, this post must have taken you ages to do! looking forward to reading about your roast!